Copying a template is a powerful action in Skytap. With just a few clicks, you can quickly copy an entire, complex template, including the VMs, networks, and template settings. If you need to work with templates in multiple regions, you can easily copy the template to each region. By default, the copied template is placed in the same region as the source (original). To copy a template to another Skytap region, see Copying a template to another region. The Copy Template window displays. The current region is selected as the Destination Region. To copy to another region, see Copying a template to another region. 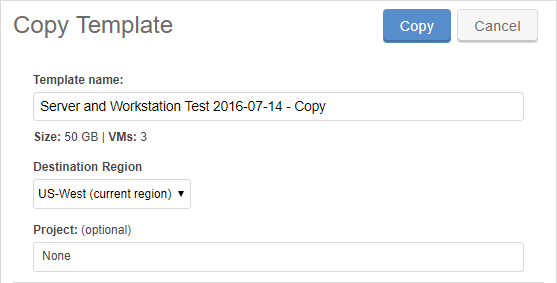 If you leave the copy page or sign out of Skytap, the copy process continues automatically. sends you an email when the copy process is complete. Generally, copying an environment in the same region is faster than copying an environment across regions. For more information, see What to expect when you copy an environment or template. Skytap creates a new published service that maps the same internal port to a new external port address. Static public IPs: The VM in the new environment has the same public IP address attached to it. When the same static public IP address is attached to multiple VMs, only one of these VMs can run at a time.